Did you get up at 5am and brave the cold to see the planets align? If you had, you would have seen something like this. Venus and Jupiter were very bright, Mercury was fainter and eventually fell behind some clouds, and I couldn't see Mars at all with the naked eye. It was only with this long exposure shot that I could see what I think to be Mars. I've put up a bunch of photos on flickr. The reason we were treated to this early morning light show was because of a rare alignment of the planets. It's not rare due to being unexpected - it's completely predictable - it just doesn't happen all that often. The next time these four planets will get together will be in 2056. The following images have been made using the excellent Solar System Live by John Walker. The site shows the positions of the planets around the Sun, and in the sky, either live or at a time of your choosing. On May 13, the four inner planets were all in a straight line and from Earth you could view the other three clumped together in the sky. The images show the solar system from above, with the orbits spaced equally for ease of viewing. From this viewpoint, the Earth spins counter-clockwise on its axis, and counter-clockwise around the Sun. The alignment of planets is not seen until just before dawn, however as the Earth continues to rotate and the Sun comes into view, the light from the Sun becomes too strong to see the planets (you rarely see stars or planets during the day). Unseen, they continue to track overhead during the day. By the end of May, as the various planets move at different orbital speeds around the Sun (a year is different on each planet), they will be in different parts of the sky and the light show over. If you take a closer look at the figure below, you'll notice that besides the aligned planets, there are actually six planets visible in the dawn sky - all planets except Saturn can be spotted if you find a dark enough area, although you'll need binoculars to see Uranus and Neptune. Even Pluto, if you still maintain it to be a planet, might be found with a small telescope - the Solar System live site still has Pluto in its diagrams. A crescent Moon will reappear near the end of May to add to the scenery. For more information, this video from ScienceCasts gives a great overview of the phenomenon, showing how the planets move in the sky throughout May. It's also a geometry lesson before breakfast. Check out science.nasa.gov for more. r is the distance between the masses. We can use this to examine the gravitational force between a one kilogram mass on the surface of the Earth and the distant planets. The distances the planets were from Earth on May 13 were obtained from Solar System Live, and their masses from NASA. I've also included the gravitational effect of my car if you were standing 50 cm from it. As you can see, the gravitational effect of my 1.5 tonne car is greater than all the planets put together. It is also important to note that on May 13, the pull of the Moon on our 1kg object was 199 times bigger than that of Jupiter's at the Earth's surface. The Sun's pull was 178 times bigger than the Moon's, and the pull of the Earth itself was 1656 times bigger than the Sun's. Essentially, the pull of the planets on an object at the Earth's surface is negligible. The calculations can be explored in this spreadsheet. Read more over at Bad Astronomy debunking the claims of astronomy, especially with regards to gravity and the tides. The age of Aquarius has arrived! Well, it will, this Friday 13th May. In a rare planetary event, Mercury, Venus, Mars and Jupiter, will appear together (within around 2 degrees of each other) in the eastern sky just before dawn this Friday. The event will be particularly spectacular for Sydneysiders. From 5am, the four planets will be clearly seen just above the horizon in the east. The brightest planet will be Venus sitting in the middle of the group. Just above and to the left of Venus and almost as bright is Jupiter. To the right of Jupiter and slightly fainter will be Mercury. Sitting below these three planets and fainter again will be Mars. 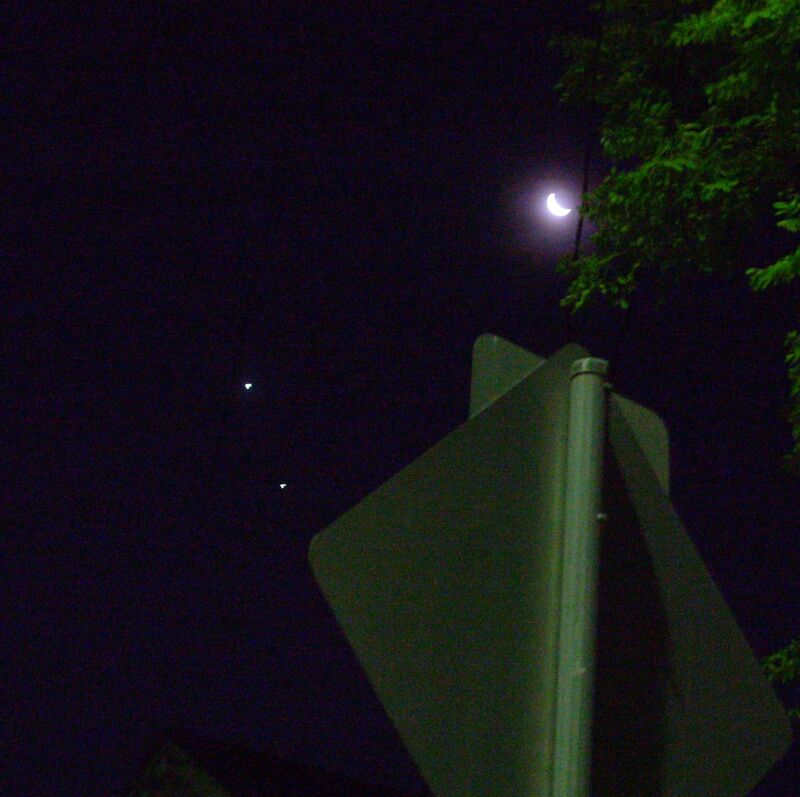 The four planets are quite bright, so if you are up early enough, you will see them over city lights. If you have been up early recently (I had the pleasure of a 5am start today for work...) you will have already noticed Venus and Jupiter together. The last time these four planets came together was in 1910, but the planets were too close to the Sun to observe. The next close grouping of these planets will not be until 2056. “The close grouping of these particular four planets only happens every 50 to 100 years. We are hoping for a clear autumn morning for this unique sight in the southern sky,” said Sydney Observatory’s acting curator, Andrew Jacob. The event will be visible to the naked eye and Sydney Observatory is holding a breakfast viewing. If you are interested in getting along, there is more information at www.sydneyobservatory.com.au, and check out the Observatory's blog. Addendum: Here's an explanation of how the alignment gave such a great view from Earth, and why my car is more likely to influence your personality - astrologically speaking - than this rare alignment.